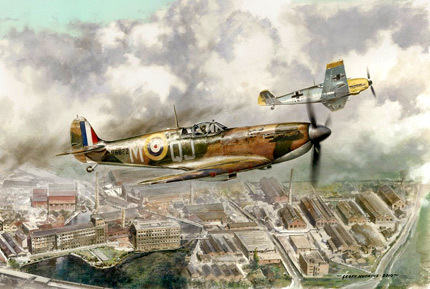 This brand new aviation print by Geoff Nutkins to commemorate the 70th Anniversary of the Battle of Britain will be launched at Ruxley Manor on Saturday 28th August 2010. “Local Hero” depicts Sergeant Trevor Oldfield of No.92 Squadron in combat during the morning of 27th September 1940. Later that same day this young RAF pilot was shot down and killed at Hesketh Park, Dartford. Eyewitnesses recalled how the 21 year old pilot tried heroically to miss the houses as his Spitfire fell to earth. A memorial stone in Trevor’s memory was laid by the Shoreham Aircraft Museum in Hesketh Park in 2007. The new print, signed by all pilots present at Ruxley on Saturday 28th of August, will be available on the day for £47.50. All proceeds go towards the Museum’s ongoing Memorials Project. You are currently browsing the Shoreham Aircraft Museum – News archives for August, 2010.